A new audiobook/CD hybrid has entered our pantheon lately—a bit of a throwback-style recording, very much in the style of Peter and the Wolf. 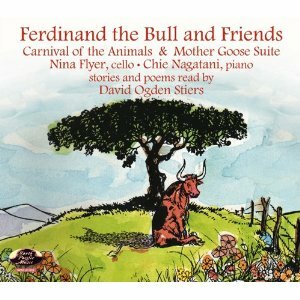 It’s titled Ferdinand the Bull and Friends, sensibly enough given that its first and largest portion consists of actor David Ogden Stiers—probably still best-known to our generation as the pompous Major Winchester on TV’s M*A*S*H—reading the Munro Leaf classic. He’s accompanied by music written for this recording by Mark Fish, and performed by cellist Nina Flyer and pianist Chie Nagatani, which makes use of themes for characters and recurring events, much as in the Prokofiev piece. It’s kid-friendly and just plain lovely, and Stiers reads wonderfully, capturing all the passion and beauty that’s kept this story alive all these years. Also here is Camille Saint-Saëns’s The Carnival of the Animals, arranged by Fish and performed by the same musicians alongside clever poems by Ogden Nash (also read by Stiers) that were originally written to accompany a 1949 recording of the piece. Ravel’s beautiful Mother Goose Suite finishes things off. As if that weren’t enough, the CD is packaged with a fun little set of illustrated cards, one for each of the animals in the Saint-Saëns piece’s menagerie. The entire package feels a bit unusual in this day and age, put together with a touch of whimsy rather than the firm marketing hand we’ve come to expect in entertainment products. The effect is refreshing, but more than that, everything works together marvelously. Our boys (especially the six-year-old) were both mesmerized by the music and Stiers’s voice from the start of the recording. For some reason—and I admit this may just be a strange association of mine—it’s been our go-to-recording to put on for the kids on a Sunday morning after breakfast, a little non-force-fed culture to start off the day.